UNITED NATIONS, December 22/23 -- With the UN Budget committee at work at 2:30 am on December 23, the number of issues on which a contested vote would be called was whittled down to two, or three at most. The main achievements, though, would be under or unreported, committee members complained to Inner City Press. Surprising to some, Iran is still calling for a vote on the funding of the Panel of Experts of its Sanctions Committee. On the other side of the coin, the Durban III event in September will be voted against by, among others, Canada -- which has already said it won't participate. Also causing agita at 2 am is a merger of functions of the offices for the Prevention of Genocide and of the Responsibility to Protect. The opponents of R2P say it has never been approved, and oppose the merger. As the Fifth Committee members mill around past midnight, with bottles of wine and pizza boxes on tables, a deal is said to be near on R2P, while votes are predicted on Iran's Panel of Expert and on Durban III. Meanwhile some Committee members bemoan the lack of coverage of the bigger ticket items: continuing contracts and so-called common system. As one heart felt developing world committee member told Inner City Press, staff are 70% of the UN's costs and therefore its major asset. They need to be given security, especially working in some of the most dangerous places in the world. And to pay funds and programs staff more than Secretariat makes no sense. This too, they say, will be part of the package. The votes, it is predicted, still come December 23. Watch this site. There are additional political issues around the UN's funding of a Durban conference review day in September, and Iran trying to defund the Panel of Experts of its Sanctions Committee. 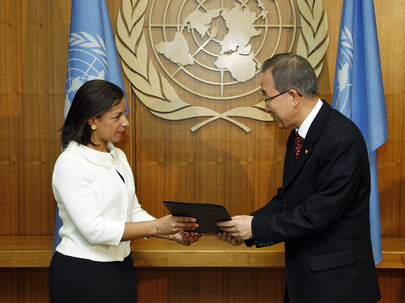 Harmonizing UN system contracts has been a theme since September in the budget committee. UNICEF came and argued that it should be allowed to pay its people more, since it needs “better” people in order to attract private sector support. UNHCR and the World Food Program, among others, came to make the same pitch. The phrasing, and the arrogance, troubled many. But the argument grew more subtle with example of staffers leaving UN peacekeeping missions in order to work for UNICEF to earn more money. There are also examples of seeming UN peacekeeping officials, like Alan Doss when in Liberia and the Congo, secretly being under better paid UNDP contracts. To avoid at least some of these scams, the proposal is to harmonize contacts, with some sort of a phrase in or grandfathering period. This may raise costs, and countries which are cutting back pay to their own workers are hard pressed to vote increases for UN system staff. Similarly, the Permanent Representative of Tunisia recently admitted to Inner City Press that his country's announced plans for a Youth Conference have fallen through due to lack of funding. Still, a deal is predicted for December 22 or 23. 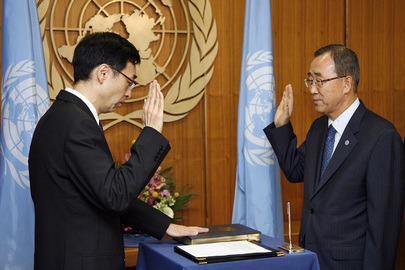 Member states are complaining about Ban Ki-moon's Secretariat not doing enough of the heavy lifting on “continuing contracts,” leaving Missions like Singapore having to do the calculations. A recorded vote is predicted on funding the Durban III day in September, and perhaps on Iran's proposal to defund its Sanctions Committee. Why aren't North Korea and Sudan, for example, making the same proposal to undercut their Sanctions Committee? At Tuesday's UN noon briefing, Inner City Press asked Ban's acting Deputy Spokesman Farhan Haq for any comment from Ban about Durban III. "The member states decide," he said. Also referred from the Third Committee is the question of Myanmar. Despite evidence that staff time has been redevoted from Myanmar to other uses in the Department of Political Affairs, nothing has yet been done. Tuesday night in the North Lawn, the new venue for budget committee rituals, included two diplomats from Cote d'Ivoire chatting nervously with the Press. 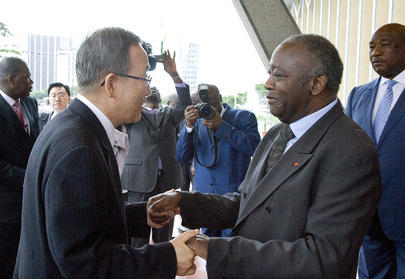 Earlier Ban Ki-moon urged the General Assembly to disaccredit Permanent Representative Djedje. What would this mean for others in the Ivorian mission? Their budget expert just keeps working. It is the Fifth Committee ethic. Watch this site.